Taken as a shot, nutrient-rich wheatgrass is a trendy diet supplement that's purported to treat a number of different ailments from tooth decay to immune deficiency. Wheatgrass powder, made from dried wheatgrass juice, offers a convenient way to incorporate more wheatgrass into your meal plans. Consult your health care provider before adding dietary supplements such as wheatgrass to your diet. Powdered wheatgrass preparation varies depending on package instructions, so always check the label before preparing it. Depending on the product you choose, you may mix 1 tablespoon of wheatgrass powder with 2 ounces of water. Some wheatgrass powder makers say you can also mix the powder in juice, which may improve your tolerance of the bitter juice. Powdered wheatgrass may be a more concentrated source of nutrients than the fresh juice. One serving of wheatgrass powder contains 35 calories, 4 grams of carbs, 2 grams of fiber and 2 grams of protein. The juice is an excellent source of vitamin A in the form of beta-carotene, vitamin K, vitamin C, ribovlavin, folic acid and manganese, meeting 20 percent or more of the daily value per serving.. A 2009 study published in Indian Journal of Clinical Biochemistry also notes that reconstituted wheatgrass powder has antioxidant activity. Powdered or fresh, wheatgrass juice is an acquired taste. Although reactions are mixed, some people may experience nausea because of its strong taste. Also, because it's a sprout, there's concern of microbial contamination. 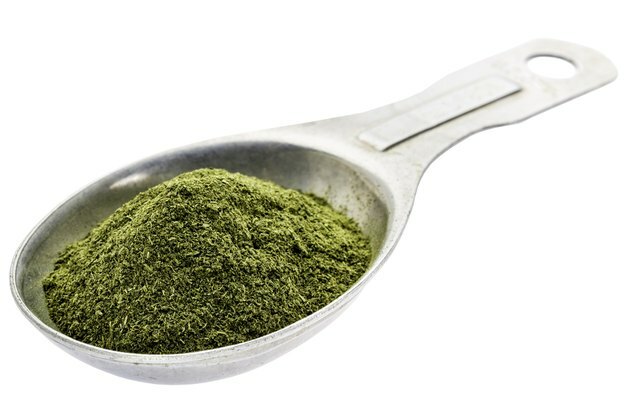 Unless your powdered wheatgrass has been heat-treated to kill bacteria, there's a risk that it may be contaminated. The U.S. Food and Drug Administration notes that sprouts are a potential source of E. coli or salmonella and there is no good way to eliminate the bacteria other than preventing contamination. Try blending wheatgrass powder in your smoothie or adding it to your morning oatmeal. Sprinkle some of the powdered supplement into your bowl of vegetable soup or salad greens, or mix it into plain yogurt. It also adds an earthy element to a cold grain salad.